Season 11 of Food Network Star begins on Sunday, June 7th, but you can already watch the first episode if you want. Premiere episode of Top 5 Restaurants on Monday, June 15th where the top 5 restaurants in categories such as burgers, steakhouses, and BBQ joints are revealed. New Primetime episodes of American Diner Revival, Beat Bobby Flay, Chopped, Cutthroat Kitchen, Diners, Drive-Ins and Dives, Guilty Pleasures, Mystery Diners and Guy's Grocery Games. New Daytime episodes of Daphne Dishes, Giada at Home, The Kitchen, The Pioneer Woman, Southern at Heart and Trisha's Southern Kitchen. Not on the press release but premiering in June is Cake Wars on Monday, June 29th. It is pretty much Cupcake Wars, but with cakes instead and Ron Ben-Israel is a judge. Food Network's lineup raises temperatures in June with new primetime series, seasonal specials and fan-favorite returning series! Primetime gets wild with the premiere of Craziest Restaurants in America on Wednesday, June 3rd at 10pm, visiting some of the most OUTRAGEOUS and bizarre food institutions in the nation. Food Network Star returns Sunday, June 7th at 9pm, as 12 contestants led by judges and mentors Bobby Flay and Giada De Laurentiis compete to claim the coveted title. Then, Food Network sampled the best-of-the-best nationwide and counts down America's top burger spots, steakhouses, BBQ joints and much, much more in new series Top 5 Restaurants premiering Monday, June 15th at 10:30pm. Also on the primetime menu are new episodes of American Diner Revival, Beat Bobby Flay, Chopped, Cutthroat Kitchen, Diners, Drive-Ins and Dives, Guilty Pleasures and Guy's Grocery Games. Returning to daytime on Sunday, June 7th at 11:30am, blogger and home cook Daphne Brogdon shares her family-friendly meals in an all new season of Daphne Dishes. Daytime dives into new episodes of Giada at Home, The Kitchen, The Pioneer Woman, SOUTHERN AT HEART and Trisha's Southern Kitchen. Plus, FoodNetwork.com is the destination for fun-in-the-sun summertime entertaining, with recipes, tips and guides for the season, and debuts new web series Foodie Call with Justin Warner exploring the latest trends in food. Join the Food Network conversation on Facebook and Twitter. Ty Pennington and Amanda Freitag are on a mission to revive classic American diners across the country. Heading to Main Streets across the U.S., they are empowering locals to save their own struggling diners. With only days to transform a cherished diner in desperate need of a physical and menu makeover, they will hit the ground to rally the locals to help ambush the unsuspecting owner with a surprise of a lifetime. It's a good old-fashioned barn raising -- let the AMERICAN DINER REVIVAL begin! Online, find photo galleries showcasing diner makeovers and behind-the-scenes blog posts on FN Dish. Join the revival with #DinerRevival. Premiering Thursday, June 4th at 10pm - "No Fear"
The stars align when Southern at Heart's Damaris Phillips teams up with CHOPPED JUDGE ALEX Guarnaschelli in this battle of culinary gladiators. New England bad boy Will Gilson brings his modern cuisine against the Fusion fare of former Navy Seal, chef Lawrence Males. Premiering Thursday, June 11th at 10pm - "Who's Your Daddy?" This battle is for the dads when New Jersey's own chef Gregory Torrech laces up his bootstraps against Moroccan chef Sam Marvin. CHOPPED judge Scott Conant and Haylie Duff of The Real Girl's Kitchen decide who has what it takes to face Bobby in this Father's Day battle. Premiering Thursday, June 18th at 10pm - "No Formalities"
Chef Tre Wilcox brings his high energy against Baltimore's Sarah Acconcia in this battle for bragging rights. The Kitchen's Sunny Anderson and Food Network veteran Giada De Laurentiis bring their wits and expertise to the arena to try to Beat Bobby Flay! Premiering Thursday, June 25th at 10pm - "Mavericks"
Trash talk is in the air when All-Star Academy's Michael Symon and author and television host Daphne Oz arrive in the arena to beat up on their friend Bobby Flay. Heavy-hitters chefs Sylvia Casares and Braden Wages square off in a battle of sheer will. Premiering Tuesday, June 2nd at 10pm -"Hot Stuff"
Will the chefs think the baskets in this special competition are too hot to handle? In the first round, the heat is on with habanero peppers. In the entree round, the competitors must work with one of the hottest peppers known to man, in beef jerky form. The finalists must find a way to balance spice and sugar in their desserts in the final round. Premiering Tuesday, June 9th at 10pm -"Judges' Face-Off"
It is a friendly competition between friends, when the CHOPPED judges face off with baskets containing leftover ingredients. In the appetizer round, the chefs must turn tuna noodle casserole into something new. Rice left in a pan and soup saved for later are two of the ingredients in the entree basket. In the dessert round, leftover cake must be turned into something innovative and delicious. Premiering Tuesday, June 16th at 10pm -"Big Barbecue Bout"
It is a battle for all the carnivores, celebrating the art of barbecue in the CHOPPED kitchen. In the first basket, the chefs find a regional barbecue sauce and jumbo shrimp. In round two, the chefs scramble to make delicious pork spare ribs entrees. After two savory courses, the last two chefs must make sweet and hearty desserts with bananas and coconuts. Premiering Tuesday, June 23rd at 10pm -"Thrill of the Grill"
The chefs learn that they must grill something in each round of this competition. For their appetizers, the chefs discover watermelon and wine coolers in the basket. A beautiful cut of beef and tedious-to-prep beans await the chefs that make it to the second round. A cone of sugar and a pitcher of lemonade are two of the fun items found in the dessert basket. Premiering Tuesday, June 30th at 10pm -"Scoop's On!" It is an ice cream dream come true with an entire CHOPPED competition devoted to everyone's favorite sweet, cold treat. In the first round, the chefs find some beautiful gourmet scoops in cones, which they must find a way to make work with halibut. In the entree round, another ice cream surprise awaits the competitors, as well as some premium cuts of beef. When the two finalists move on to the dessert round, they will have two ice cream machines and one goal: frozen perfection. Online, catch behind-the-scenes photos, plus video previews and highlights. Join the conversation at #Chopped. Craziest Restaurants in America - Premiering Wednesday, June 3rd at 10pm - SERIES PREMIERE! Craziest Restaurants in America travels coast to coast to count down the most unique, most outrageous, most outstanding, and even the most bizarre food establishments that dish out delicious meals and memorable dining experiences. From an underwater cafe to a zombie-themed bistro, these are the restaurants that leave customers saying, "Wow!" Online in May, check out the restaurants with the most OUTRAGEOUS meals and memorable dining experiences across the country, and find the locations of the restaurants featured on the show. Join the crazy conversation with #CraziestRestaurants. Premiering Sunday, June 7th at 10pm -"Carne Diem"
One chef gets on a roll using a twisted pan. Then, a big burrito bestowed by host Alton Brown causes someone even bigger problems. Finally, a chef learns that there is nothing more helpless than a "kitchen" up a tree. Premiering Sunday, June 14th at 10pm -"The Best of the Worst"
Host Alton Brown brings back some of the worst sabotages of all time. One chef finds himself cooking upstream. Then, someone's chicken parmesan gets canned. Finally, a chef gets completely turned around while making crepes. Premiering Sunday, June 21st at 10pm -"Sax, Lies and Artichoke Dip"
Host Alton Brown has one chef popping wheelies while making a dip. Then, someone nearly has a meltdown cooking on Mt. Stromboli. Finally, a chef just might blow it making waffles in a saxophone. Premiering Sunday, June 28th at 10pm -"Tikka Me Alton"
Guest judge Susan Feniger samples the chefs' smoothie moves. Then, someone takes a ride they will never forget on an elephant. Finally, a chef raises the roof in an oatmeal cookie challenge. Online, go behind-the-scenes with an on-set tour video featuring host Alton Brown sharing his secret strategies for success, plus original series Testing the Sabotages and new episodes of Alton's After Show. Follow the mischief and strategy on Twitter using #CutthroatKitchen. Premiering Monday, June 1st at 9pm - "Back to the Beginning"
Get ready to open the vault for the hour that started it all -- the very first Triple-D episode ever. Only this time, it is reloaded with plenty of extras from Guy himself, recounting his original trip through Flavortown and some totally unforgettable firsts. Guy's generously dishing out the inside scoop, fun facts and personal stories making this a retrospective journey not to be missed. Premiering Friday, June 5th at 10pm - "Intercontinental Flavorfest"
This trip, Guy hits up world flavors tucked away in the USA. In Los Angeles, a Korean-Mexican mashup serves up short rib tacos and spicy pork chimichangas. Nearby in Los Angeles' Chinatown, a New Orleans-inspired joint cooks up Big Easy po' boys and crawfish mac and cheese. In Charlotte, North Carolina, a Serbian pizza place dishes out European-style calzones and a stuffed cabbage specialty. Premiering Monday, June 15th at 9pm - "Flavortown Faves"
This trip, Guy hits up all sorts of favorites straight outta Flavortown. These are the off-the-chain joints filled with killer cuisine and crazy characters, like a double-wide bus cranking out supersized hot dogs in West Virginia, ping pong mixed with pizza in D.C., and a fish extravaganza with all kinds of aloha spirit in Hawaii. These real deal diners, funky fusion, global greats and standout sandwiches, are all packed into one flavorful hour of Triple D favorites. Premiering Friday, June 26th at 10pm - "A Bowlful of Soul"
This trip, Guy goes all in for some comfort and soul. In Charlotte, North Carolina, a down-home hangout dishes out low country favorites, like killer collard greens and standout shrimp and grits. In Las Vegas, the standout strip mall spot serves their crepe specialties with everything from savory beef to sweet caramel apples. In Los Angeles, a mom and pop shop fires up tasty turkey chili and dynamite dogs on cornbread buns. Long-running hit primetime series FOOD NETWORK STAR returns for season eleven with twelve talented hopefuls competing for the ultimate prize: their own Food Network show. Culinary superstars Giada De Laurentiis and Bobby Flay are back to host the new season with guest mentors joining the action throughout the season. 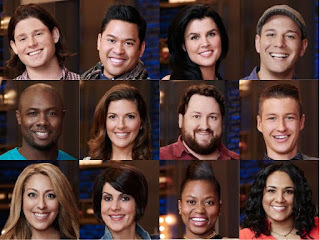 Tune in to find out who possesses the personality and kitchen chops to be the next Food Network Star. Premiering Sunday, June 7th at 9pm - "Food Network Star Festival'" - SEASON PREMIERE! Premiering Sunday, June 14th at 9pm - "Savory Baking"
Knowledge and the ability to adapt are key qualities to becoming a star, and the finalists must create an inspiring dish using only ingredients and leftovers that can be found in an average family's refrigerator then perform a camera challenge for Giada, Bobby and guest judge Melissa d'Arabian. Then the finalists use their imaginations to create a savory dish inspired by the world of desserts, with Iron Chef Alex Guarnaschelli joining Giada and Bobby at the judge's table. Premiering Sunday, June 21st at 9pm - "Trendy Dinner"
Keeping up with the latest food trends is imperative, so the contestants are tasked to create and photograph trendy "tiny" foods. They are then split up into two teams for a challenge to create a five-course meal where each course corresponds with a buzzword. Sunny Anderson and Geoffrey Zakarian join the selection committee this week to decide who will be go home. Premiering Sunday, June 28th at 9pm - "Fourth of July Cookout"
A FOOD NETWORK STAR has to be able to win over a crowd - so to celebrate the Fourth of July, the finalists are split into teams to develop a cohesive menu, shop for ingredients and feed a crowd of hungry families at a holiday cookout. Guest judge Bobby Deen joins Bobby and Giada to determine which team has the best performance, and one finalist from the lowest performing team is sent home. Online, find the FOOD NETWORK STAR online headquarters with weekly photo galleries, exit interviews, finalists' journals, exclusive video interviews with guest judges and winning recipes. Watch full episodes of the premiere, the episodes leading up the finale and the finale itself online and on mobile the day after premiere on FoodNetwork.com. Don't miss the return of the six-episode original web series Star Salvation premiering Sunday,June 28th. The winner of this series hosted by Iron Chef Alex Guarnaschelli and FOOD NETWORK STAR Season 7 Winner and co-host of THE KITCHEN Jeff Mauro will re-enter the competition on August 9 for a second chance at stardom. Also check out the Fan Favorite Sweepstakes where fans can vote online for their favorite finalists all season long, and can enter for a chance to win weekly prizes and a cash grand prize. Join the conversation with #FoodNetworkStar. In Guilty Pleasures, your favorite Food Network stars reveal their best kept, most intimate, guilty pleasure food secrets for the first time ever! We visit the locations and meet the chefs who make these crazy, ooey-gooey, "I-can't-believe-I'm-eating-this" food masterpieces! From a 24-layer chocolate cake, to a mega-bacon cheeseburger, to a filet mignon covered in fried oysters, Guilty Pleasures shows off dishes whose very names make your stomach rumble. Online, check out the food masterpieces featured on the show and where to try them, find photo galleries and weigh in on these favorites on FN Dish. Share food secrets with #GuiltyPleasures. Premiering Sunday, June 7th at 8pm - "Triple G Redemption'"
Four chefs return to Flavortown for a second chance at the $20,000 Shopping Spree, but host Guy Fieri does not make this trip any easier, as the four chefs make a redemption dinner using the ingredients that tripped them up when they first competed. Next, the contestants are tasked with creating an unforgettable high-end lunch using less desirable items from the Clearance Carts. Finally, two chefs go head-to-head to make their best dish after a toss of the dice decides what must be included in their recipe. Premiering Sunday, June 14th at 8pm - "Daring Kitchen Duos'"
Premiering Sunday, June 21st at 8pm - "It's a Fieri Father's Day!'" Four fathers are out to prove they are the World's Greatest Dad in the kitchen, and Guy Fieri's son, Hunter, is out to prove he's the best co-host on Triple G! First, the chefs are forced to use the express lane when making a family dinner. Next, the dads are tasked to make a guilty pleasure but the ominous Food Pyramid will determine what extra ingredients the chefs must also use. Finally, the last two dads are given only two minutes to shop for their Date Night Dinner before Guy swaps their carts! Premiering Sunday, June 28th at 8pm - "Serving Up Summer!" Four chefs celebrate summer with a barbecue block party where a roll of the dice picks the crazy items in their dish. Then the chefs have to improvise when their seafood spectacular comes with a weight restriction. In the final round, the chefs' summer plans are turned upside-down when they have to turn the ingredients for an all-American cherry pie into a chicken dinner. Online, catch interviews with host Guy Fieri, photo galleries with episode recaps and highlights; plus find ongoing blog coverage. Follow the games on Twitter using #GroceryGames. Premiering Wednesday, June 3rd at 9:30pm - "Partner Problems"
Former client Jaime contacts Charles to help determine if he should invest in a failing California restaurant. MYSTERY DINERS Kendall and Kiel go undercover and discover the current owner isn't being honest about all of his problems. Premiering Wednesday, June 10th at 9:30pm - "Art Show Sting"
After noticing numerous discrepancies with the catering company she uses to cater her art shows, Patricia contacts MYSTERY DINERS for help. Charles sends in Jamie and Brianna and discovers an even bigger problem with the assistant curator. Premiering Wednesday, June 17th at 9:30pm - "Young Blood"
When Joe, the owner of Harvey's Steakhouse in Huntington Beach, California, notices a decline in his restaurant's older customers, he contacts Charles to investigate. MYSTERY DINERS Destiney and Hal go undercover to find out if the staff is hosting unauthorized events to drive in younger patrons. Premiering Wednesday, June 24th at 9:30pm - "Backdoor Bootlegging"
Rick, the owner of Weiland Brewery in Los Angeles, contacts MYSTERY DINERS after noticing discrepancies with his beer supply. Charles sends in Brianna and Jamie and discovers a large scale bootlegging operation is taking place right under the owner's nose. Outrageous Wedding Cakes - Premiering Saturday, June 13th at 9pm - SPECIAL! Here comes the cake! Wedding season is here and Food Network is serving up a second helping of extravagant, ornate, enormous and downright OUTRAGEOUS cakes! From six-tier masterpieces floating in midair to thousands of sugar-winged butterflies, from optical illusions to show-stopping cakes masquerading as life-size topiary swans, this all-new one-hour special will raise the bar in cake confections at weddings across the nation. Top 5 Restaurants - Premiering Monday, June 15th at 10:30pm - SERIES PREMIERE! For the first time ever, Food Network is naming America's top five burger spots, the ultimate five steakhouses, the best five BBQ joints and more! From pizza and ice cream to tacos and fried chicken, each episode is taking on one of America's favorite foods and telling you exactly where to get the best. We'll meet the MAKERS and culinary masterminds behind these ultimate food creations as the battle for top spot is finally crowned. Online in June, check out America's top steakhouses, burger spots, BBQ joints and more. Look for photo galleries showcasing the locations featured in each episode and polls on FN Dish encouraging viewers to weigh in on their favorite spots. Join the Top 5 Talk with #Top5Restaurants. Daphne Dishes - Premiering Sunday, June 7th at 11:30am - SEASON PREMIERE! Mom, wife, and home cook, Daphne Brogdon, brings a fresh, fun and humorous approach to feeding the family. Whether it is for a PTA meeting or a gals' night in, Daphne cooks up a storm with simple recipes that will feed a crowd and bring the family together. Premiering Sunday, June 7th at 10:30am - "East Meets Italy"
In Los Angeles, there are numerous Italian/Asian Fusion restaurants with dishes that reflect the dynamic flavors of the east and the west. Host Giada De Laurentiis explores the Japanese/Italian food culture in L.A. and makes three dishes that reflect a blend of styles and flavors like Blistered Shishito Peppers with Olive and Basil Salt, Asian Mushroom Risotto and Far East Spaghetti. Online, check out exciting updates, including recipes from the show, behind-the-scenes photos, fun facts from the culinary department, recipes, audience polls and more. Join the conversation in #TheKitchen. Premiering Saturday, June 13th at 10am - "Perfecting the Pantry"
Ree Drummond's raiding the pantry, whipping up four cupboard showstoppers. She spices up standbys with a lunch of fragrant Chickpea Curry with Rice, then for sweet treats in a hurry, No-Bake Peanut Butter Bars save the day. She even has entertaining covered with Tapenade Crostini, and rounds things off with a super-fast pantry miracle, 7-Can Soup. Premiering Saturday, June 20th at 10am - "Chuck and Crew"
Ree Drummond's father-in-law, Chuck, is spearheading a big fence fixing project on the ranch, so Ree's showing her gratitude by delivering him and his crew a rib-sticking Tex-Mex lunch. She prepares slow-cooked Spicy Shredded Pork with all the fixings, Cheese Enchiladas, with heaps of homemade sauce and on the side, cool and crunchy Chipotle Slaw. Then for a treat, she dishes up portable delicious Lemon Bars. Premiering Saturday, June 27th at 10am - "Cooking, Feeding and Eating"
Ree Drummond's knocking out hearty Breakfast Biscuits that her husband and son are coming to collect on their way to feed the cattle. While they're out, Ree's whipping up three make-ahead meals: Cajun Brisket, delicious Cheesy Sausage Rigatoni, and a Sleepin' in Omelet. Premiering Sunday, June 7th at 12pm - "Pecan-Encrusted with Love"
Damaris Phillips hosts lunch for two aunts who she's asked to make her a wedding quilt. ON THE MENU are a Pecan-Crusted Stuffed Chicken and her take on Southern risotto, a savory, toothsome bed of rice topped with caramelized asparagus. Premiering Sunday, June 14th at 12pm - "PB&J Came to Play"
Damaris Phillips and her fiancé take her niece and little friends out for a trip to a life-sized puppet theater. Damaris brings a kid-satisfying lunch for intermission: Crispy Fried Meatloaf Sandwiches topped with a sweet and tangy Green Tomato Jam, plus Carrot Raisin Salad Rolls and Peanut Butter and Jelly Cookies. Premiering Sunday, June 21st at 12pm - "Grampy's Got a Sweet Touch"
For Father's Day, Damaris Phillips invites her mother and grandfather over for a special brunch, where Grampy's predilection for sweets rules the menu: On tap are Cinnamon Roll Biscuits with Sweet Tea Caramel, a beautiful Five-Cup Ambrosia and easy Breakfast Sausage. Premiering Saturday, June 13th at 10:30am - "Record Release Party"
Premiering Saturday, June 20th at 10:30am - "Our Guys' Favorites!" Premiering Saturday, June 27th at 10:30am - "Glenda's Birthday Costume Party"
The only person who loves a costume party more than Trisha Yearwood is her friend Glenda. To celebrate Glenda's birthday, she and Trisha are cooking up a few dressed-up party food dishes for their special costume party. ON THE MENU is Warm Feta Artichoke Dip, Shrimp Croquettes with Green Peas, and Chocolate Chip Cheesecake Bars. Premiering Saturday, June 20th at 10am - THE PIONEER WOMAN - "Chuck and Chew"
Premiering Saturday, June 20th at 10:30am - Trisha's Southern Kitchen - "Our Guys' Favorites"
Premiering Sunday, June 21st at 12pm - SOUTHERN AT HEART -"Grampy's Got a Sweet Touch"
Foodnetwork.com is grilling central with all the secrets to great barbecue and top chefs' recipes to elevate the backyard bash. Find the best recipes for burgers and dogs (including beef, turkey, veggie and even fish burgers, plus hot dogs every which way) plus enough fun toppings to last the whole season. Grilled chicken is a summer cookout classic and Foodnetwork.com shares the best recipes for the juiciest, most flavorful birds; from jerk chicken to barbecue chicken, chicken tacos to beer-can chicken, plus chicken salads, sandwiches and kebabs. Find the perfect main dish recipes for the perfect summer cookout, like grilled pizza, foil-packet dinners, and grilled tacos; and sides and salads to complete the meal. Summer parties are a breeze with top recipes for packable sides and desserts, crowd-pleasing appetizers, show-stopping sweets, plus tips for stocking a bar, figuring out quantities for food and cocktails, decorating ideas and must-have summer products. Plus, summer stays slim with healthy recipes to enjoy all season long! Summer entertaining is a breeze with our best recipes for packable sides and desserts, crowd-pleasing appetizers and show-stopping sweets, plus tips for stocking a bar, figuring out how much food and drinks you need for your party, plus decorating ideas and must-have summer products. This section will have you mastering summer in no time, with expert tips and tricks for grilling and summer eating and entertaining - including how to clean a grill, how to eat a lobster, how to make perfect hamburgers and how to make homemade ice cream. FoodNetwork.com rounds up decadent desserts to keep you cool all summer long! Get recipes for homemade ice pops, ice cream confections, frozen pies, gelato, granita, milkshakes, sherbet, frozen yogurt and more. FoodNetwork.com even shares breakfast popsicles to start the day off cool. Make Dad's day special with a homemade brunch, breakfast or dinner featuring favorite recipes like grilled steak, wings, pork chops, chicken and waffles and bacon cookies. Find all the seasonal recipes you need for casual get-togethers, last-minute fetes, potlucks, barbecues and picnics. Cook with the freshest summer produce, like zucchini, tomatoes, watermelon and peaches with in-season recipes and tips from Food Network chefs. Get weekday dinners on the table, fast, with easy recipes for chicken, pasta, fish, tacos and salads, plus simple summer sides and desserts. Host Justin Warner explores food trends, meets THE EXPERTS behind them and creates dishes inspired by his foodie calls in this new web series on FoodNetwork.com. Join Justin as he gets nerdy about cold brew coffee with Gimme Coffee's Education Director Sarah Leslie, looks into the trend of kerky with Brent Young of the popular Brooklyn butcher shop, The Meat Hook, and meets up with Ivan Ramen creator, Ivan Orkin to talk noodles, ramen, and learns to work with what you have to make something better. Haven't seen the first episode. So, Christina gets sent home. And yet she is 1st place in the fan voting poll in FN star-talk. See this is what I mean by the voting being rigged. It doesn't really surprise me that Fn won't let "America" decide the winner anymore. I hope he changes his POV because I have a hard time believing they are going to choose another sandwich guy. I really like Alex. I can imagine it is fixed to keep up interest in Christina so folks will tune in to watch redemption kitchen or last chance kitchen or whatever they are calling it. I sincerely doubt people voted for her the most. No new episodes of Restaurant:Impossible. I guess we can start calling it Restaurant:Cancelled now. No wonder Irvine was throwing tantrums on Twitter. I don't go over there anymore. They've done something with their comments that has made them invisible to my browser. Well, I propose another contest to run along with this little FNS contest: let's see how many total inches of cleavage Giada shows during the series. Kinda hard to claim to be an expert when your own restaurants fail. I didn't like Cupcake Wars, but I'll watch Cake Wars for Ron Ben Israel. I miss Sweet Genius. She was terrible, "Stilettos in the Kitchen" cooking show from an unattractive woman, wrong and more wrong. I experienced the same problems. No, it was announced that it was renewed, but guessing it will be a few months before they get new episodes filmed and "in the can"
On CHopped I thought Matthew was funny, but I thought he was trying to act like an idiot for a joke. Turns out he is just an idiot. Half this cast should just go home now, they have no chance. Matthew wasn't on Chopped; he was on Cutthroat Kitchen—three times. And strangely, as much as being obnoxious is part of CK, he's more so on FNS, where just the opposite is required. oh boy, another home cook. YOU get a divorce, and YOU get a divorce, and YOU get a divorce! Divorces for everyone! I agree that the cooking talent seems to have gotten better this year. Jay ducote is my early favorite, and matthew is clearly just there to be the villain, who the heck would give that guy a show!? Funny this, matthews casting interview on FN.com, he seems more normal! Ah, yes I typed the wrong show. For what it's worth, they did not run the repackaged version of the first episode of Diners, Drive-Ins and Dives Monday night. Well, she changed her POV to Middle Eastern Mama, and it looks as if we have another one of those this season, although with a more pleasant personality. What's up with this new path the network is on taking existing shows, renaming them and calling it a premiere. I watched " guilty pleasures" and it was " best thing I ever ate" guilty pleasure edition. I think they need a boost in their creativity and development division. If they are going to rework a show ....do it ...say you are doing it. Heck, call it new and improved but don't pretend it is a new show concept. besides the truck load of makeup, she had an obnoxious and unlikeable personality that made her exceedingly unattractive. I would never watch anything she is on. yuck. stepford and edgy is a contradiction in terms. so far, she's not even slightly edgy. with Jeff Mauro one of their few recent successes, this guy is going to have to change his POV soon. I'm a little behind and just saw that Ron Ben-Israel will be back. I adore him. Joy, joy, joy!!! I wonder who will host the show. I am strangely fond of Justin Willman and Joey Fatone so I'd love to see one of them. I hope they let the contestants do their thing like the old Challenge. I hated it on Sweet Geniuis when pastry chefs had to make desserts with things like rutabaga.